The AOC AG271QX is a good 2560x1440 gaming monitor with a high 144Hz refresh rate and TN panel. It has excellent motion handling due to the fast response time and support for FreeSync. It also has very low input lag which is excellent. Unfortunately, the picture quality is below average and when viewed from up close, the edges of the screen lose accuracy due to the narrow viewing angle. 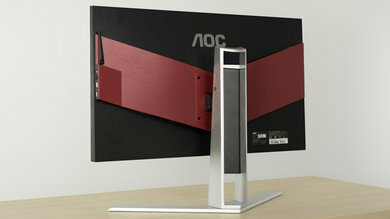 The design of the AOC AGON AG271QX is excellent. 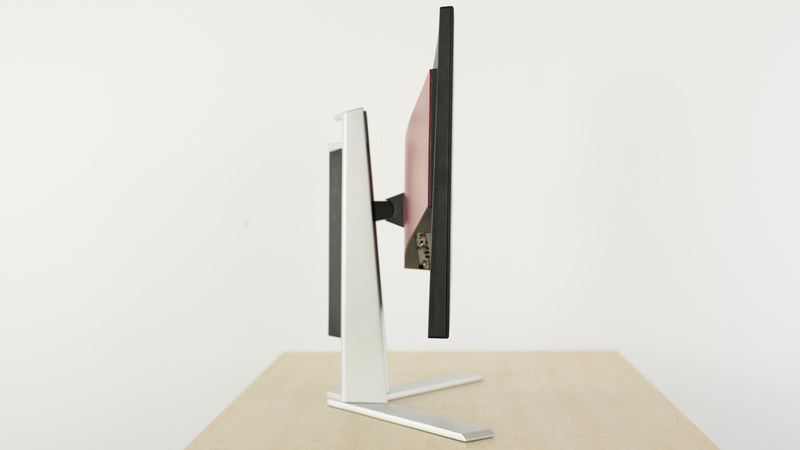 The monitor looks sleek from any angle, and the low profile V-shaped stand supports it well. It is very easy to adjust orientation or height for comfort, and the hook for hanging headphones adds extra convenience. 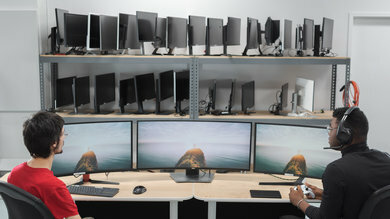 The monitor does stick out a bit from the stand though, so it can't be placed very close to a wall. The build quality feels great due to the quality metal parts. The V-shaped stand feels very sturdy and supports the monitor very well. It also has a low profile and a hole through the center for cable management. 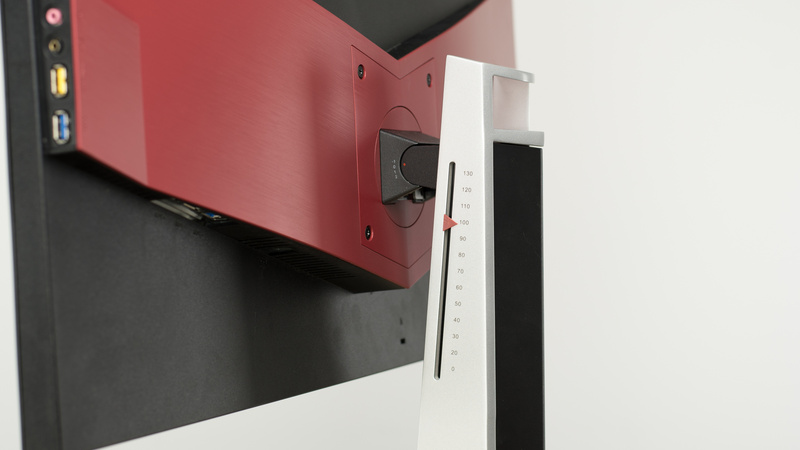 The monitor height can be adjusted easily and a marker allows making a note of a specific height, which is nice. 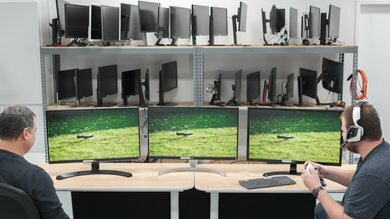 The monitor can rotate portrait, tilt, and swivel. The rear of the monitor has a stylish two-tone finish. It looks good and stands out. There is a headphone hook too which rotates out from behind the right-hand side of the monitor. The borders have an average thickness and are made of plastic. 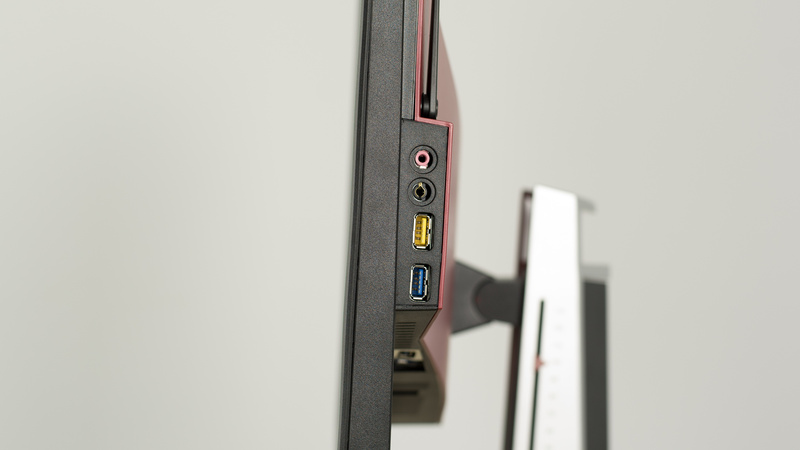 The AOC AGON AG271QX sticks quite far out when placed on the stand. 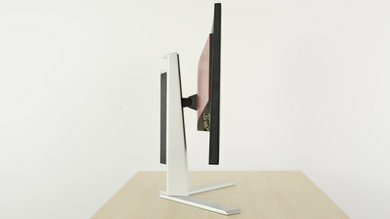 However, the monitor itself has an average thickness and looks good from the side. The build quality is great. The metal stand is quite heavy but feels high quality and the build quality of the monitor certainly won't be an issue in normal use. The picture quality of the AOC AG271QX is decent. 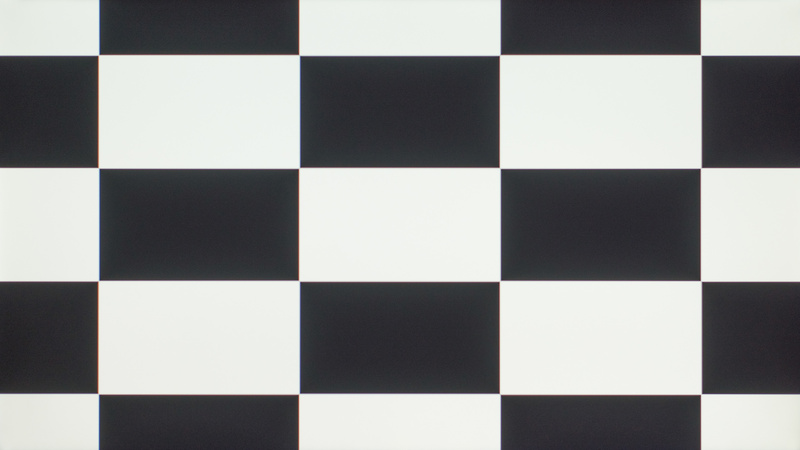 It has a TN panel, resulting in a low native contrast ratio so blacks appear gray in a dark room and the image degrades rapidly when viewed at an angle. Thankfully, it gets quite bright to fight reflections and also has a good light-matte finish. This helps to overcome ambient glare and direct reflections, which is good for a bright room. Unfortunately, it doesn't support some more advanced features, such as local dimming and HDR, to improve the picture quality further. However, support for these advanced features is rare. 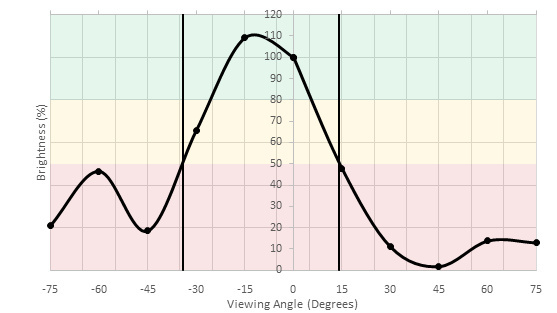 The contrast ratio of the AOC AG271QX is below average, as expected for a monitor with a TN panel.  When viewed in a dark room, blacks appear gray. The AOC AGON AG271QX monitor does not have a local dimming feature. The video is for reference only. 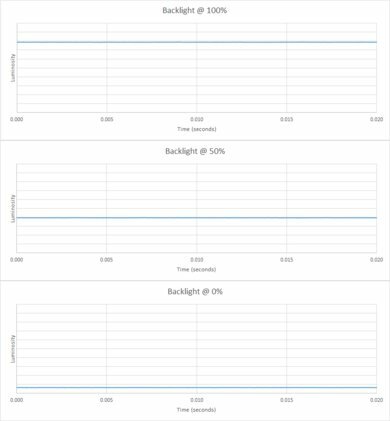 The peak brightness is great and doesn't depend on the window size so all content looks equally bright. The horizontal viewing angle is poor but fairly typical for a TN panel.  When viewed from even a small horizontal displacement, the contrast drops dramatically due to the raising black level and drop off of brightness. All of the colors shift also. 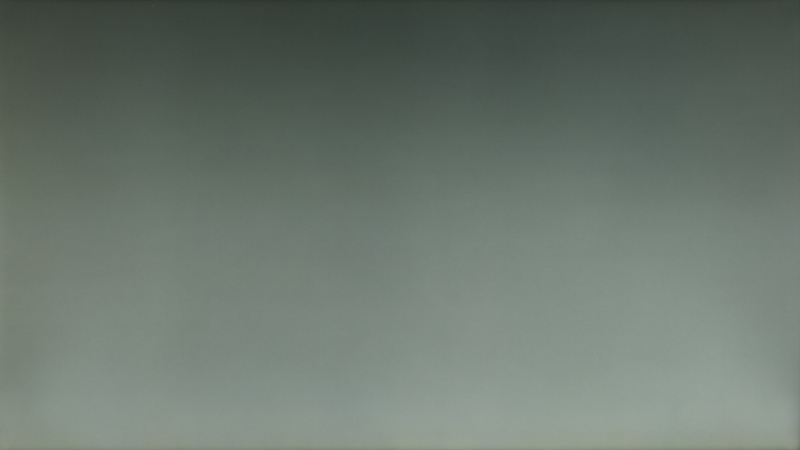 When viewed from up close, the sides of the monitor appear washed out. The vertical viewing angle of this AOC AG271QX monitor is bad. 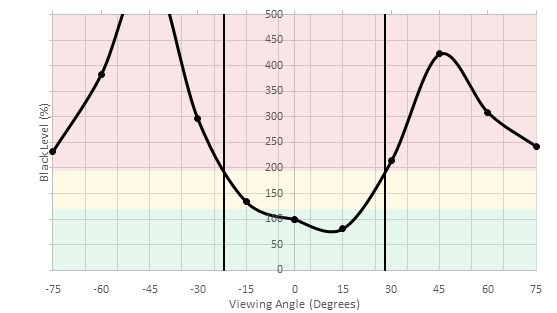 This is as expected with a TN panel, however, it results in a non-uniform screen due to the different angle to each point on the screen when viewed from up close. 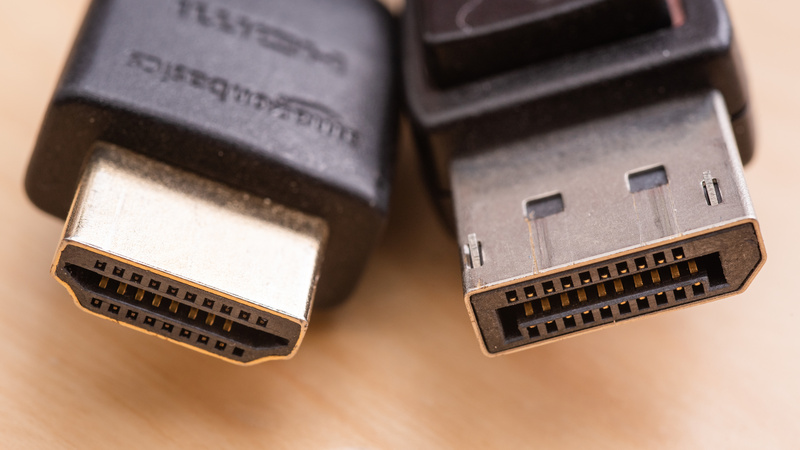 The gray uniformity of the AOC AG271QX is very good, which is great for browsing web-pages or playing media or sports without any dirty screen effect. 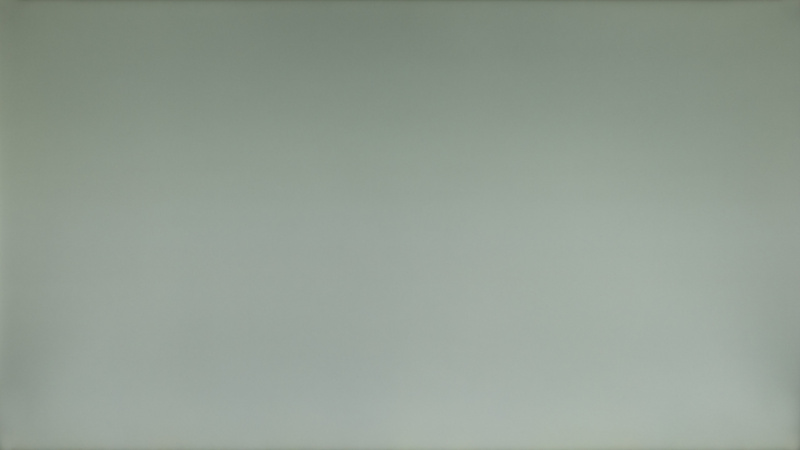 The uniformity issues visible in the photo are a result of the narrow viewing angles, which causes different sides of the screen to appear slightly different colors. 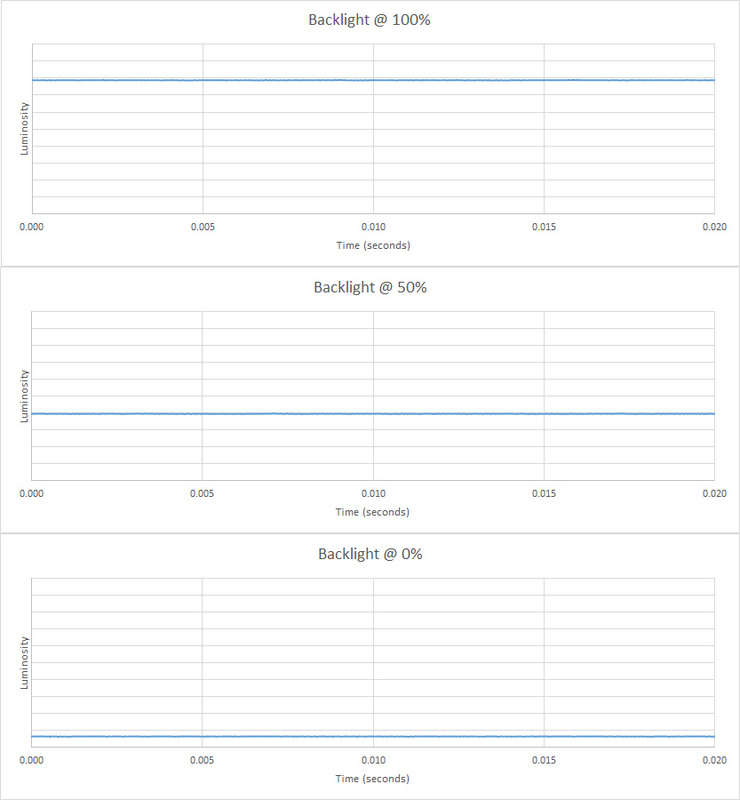 The dark gray (5%) gray uniformity is even better, and shouldn't cause issues when viewing dark scenes. The black uniformity of this monitor is below average. This results in dark games or movies appearing blotchy. The sides are also a bit darker than the center, and the top appears a bit darker than the bottom. This is in part due to the poor viewing angle. 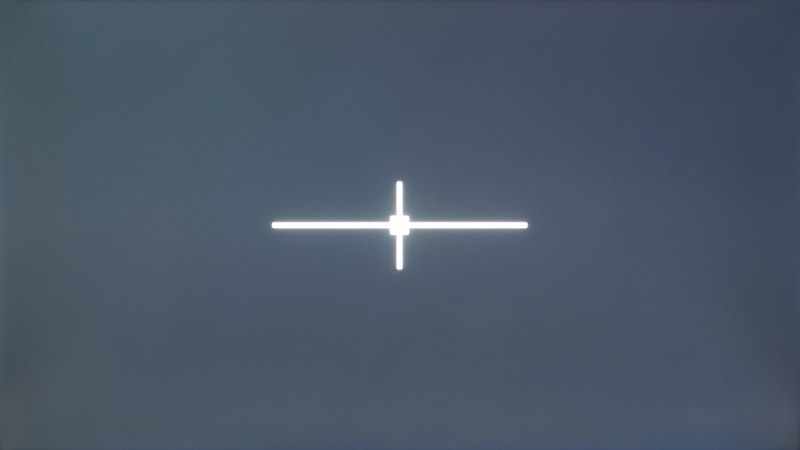 Out of the box and with the 'Standard' picture mode, the monitor has a below average accuracy. The white balance dE and color dE are both between 3.5 and 4, which at this level of inaccuracy, is noticeable for most enthusiasts out there. 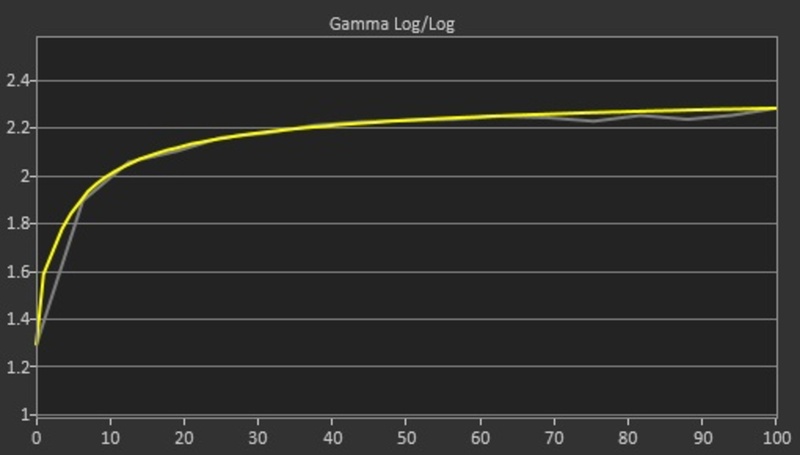 The gamma is also well under our 2.4 target that we aim for and the curve is not tracking closely at all our target curve, as you can see on the gamma picture. 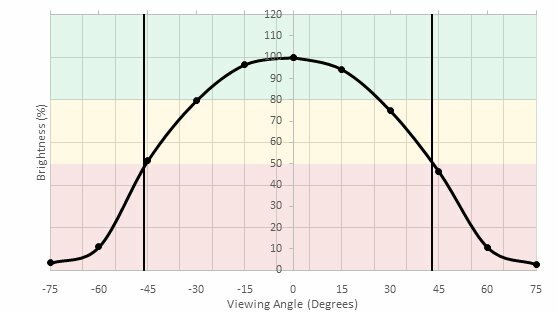 If you don't really intend to calibrate your monitor, the AOC AG271QX does not really have 'Picture Mode' per say, but instead many 'Eco Mode' and 'Color Temp.' settings. The best 'Eco Mode' setting is the 'Standard' mode since only this mode gives you control over the 'Contrast' and 'Brightness' settings. For the 'Color Temp.' 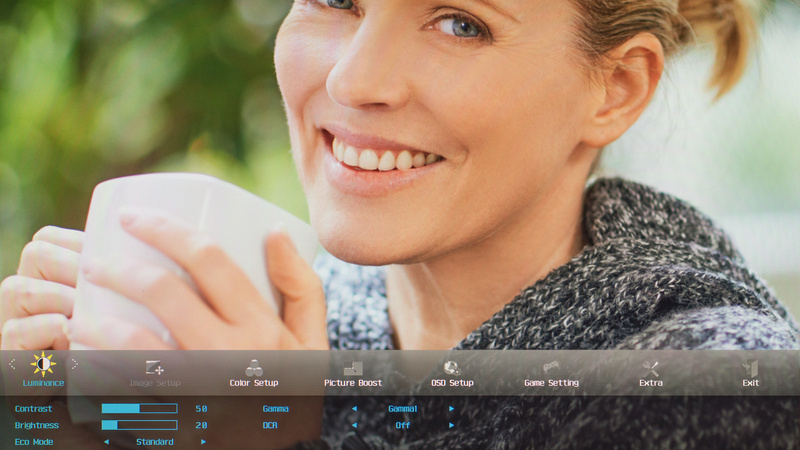 setting, you can choose from many color temperature available and select the one that you feel is the best for you. 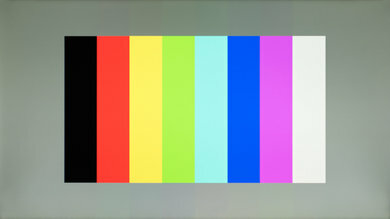 If you want to have manual control over the each of the RGB value, then you will need to set it to 'User'. After the calibration process, the AOC AGON AG271QX has an excellent accuracy. 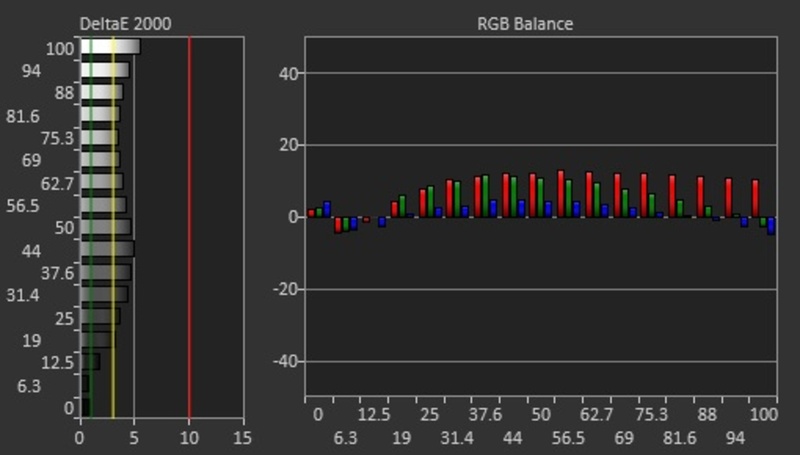 The white balance dE was brought down to 1.27 and the color dE was brought down to 1.31. 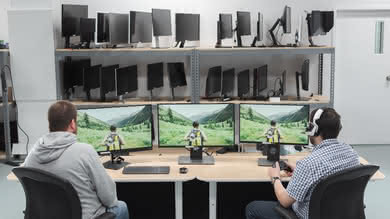 This level of inaccuracy is mostly perceivable by professionals who are used to work with a calibrated monitor and should be good for most enthusiasts. The gamma is now more close to our 2.4 target and the curve is also tracking our target curve much more closely than before. Good color gamut. 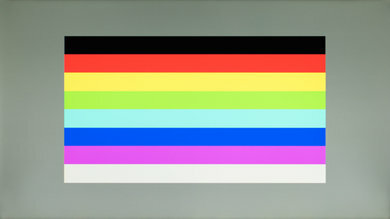 While the monitor cannot cover the standard s.RGB gamut completely, it reproduces enough of it to display saturated colors and relatively accurate content. 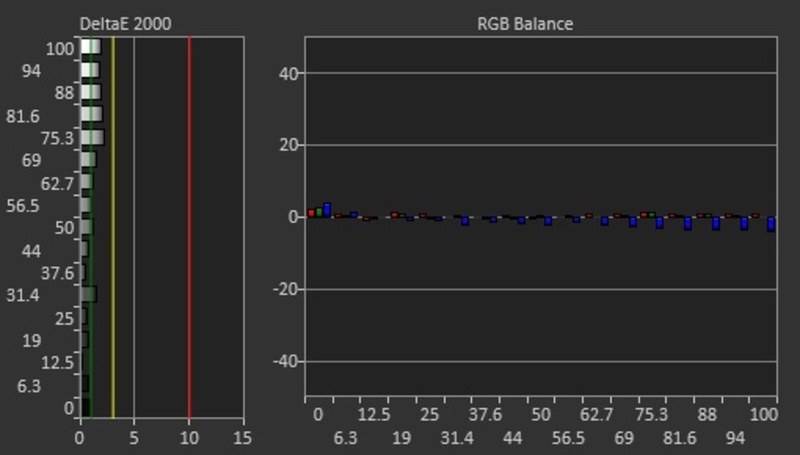 Its Adobe RGB coverage is a bit limited though, so it isn't the best choice for more professional use. 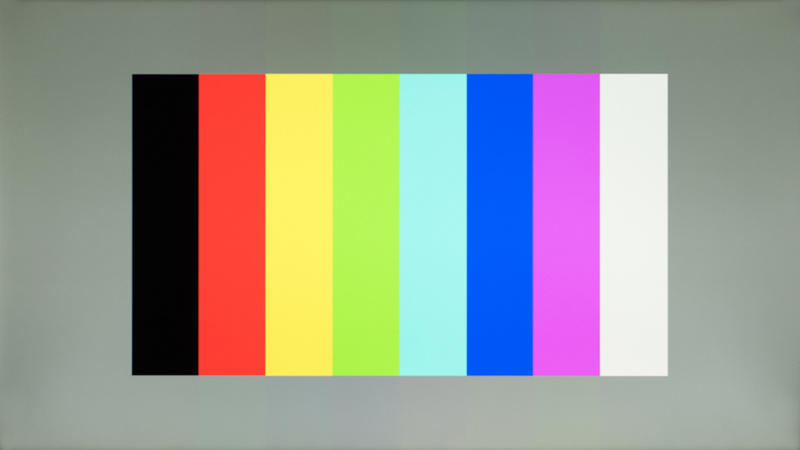 The AOC Agon AG271QX is able to fill most of the sRGB color volume. It isn't able to cover deep blacks or dark colors due to the low native contrast ratio but otherwise performs well. 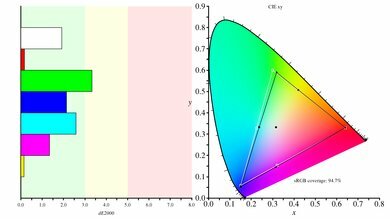 In the wider Adobe RGB color space, it isn't able to reproduce the more saturated colors, especially in the green areas. 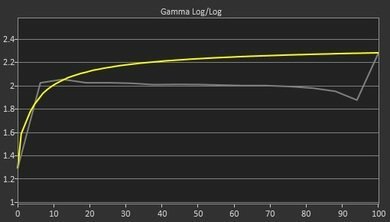 HDR gamuts are not supported as the monitor only supports SDR. 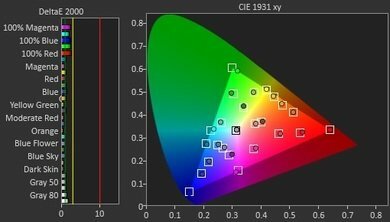 HDR color volumes are not supported as the monitor doesn't support HDR. No signs of image retention are visible on this AOC AG271QX monitor, which is excellent. 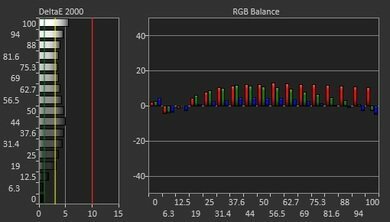 The monitor is able to display 10 bit gradients very smoothly, which is excellent. Almost no issues can be seen in the gradient. The AOC AG271QX has no major issues with bleeding of colors. 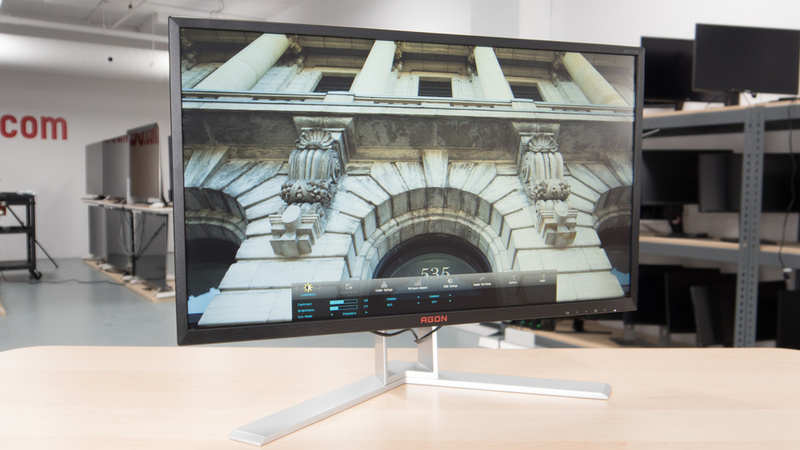 This monitor is good at handling reflections with a light matte finish that helps to diffuse direct reflections across the screen and reduce their intensity. It is good enough for most rooms but may be an issue for bright rooms. The motion handling of the AOC Agon AG271QX is excellent. 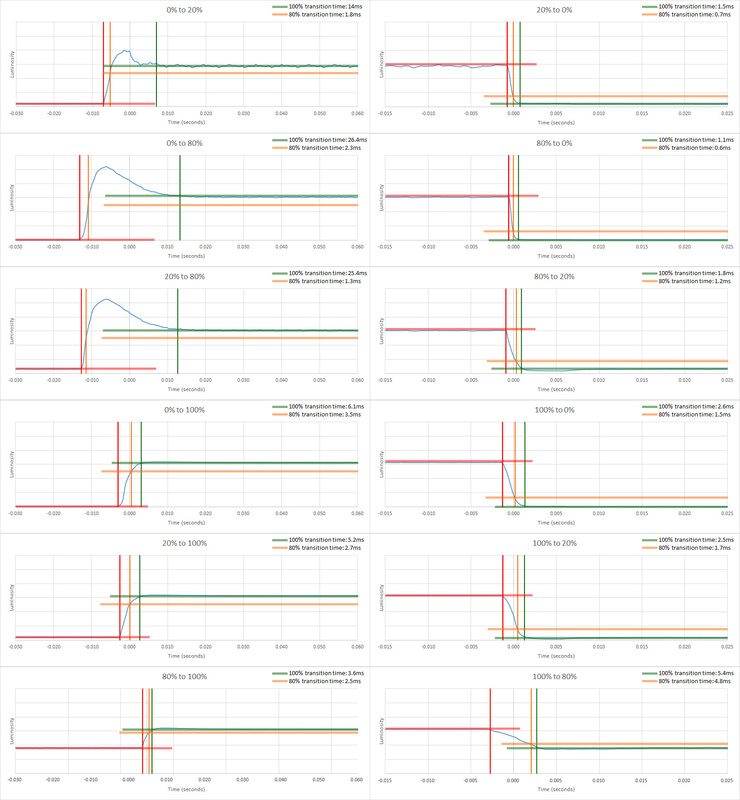 It has an amazing response time, which results in very short trails following moving objects. It uses DC dimming, so the screen is flicker-free, but unfortunately, BFI cannot be enabled to clear up motion. 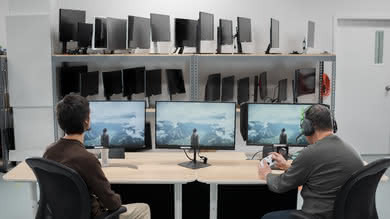 The monitor has a high native refresh rate of 144Hz and can use FreeSync to display variable frame rates lower than its native refresh rate when used with a compatible video card. The AOC AG271QX has an extremely fast response time, which is excellent when viewing fast-paced content such as first person shooters.  This results in no visible blur trailing following moving objects, with almost all of the blur in the photo above as a result of image persistence. Pixel transition speed can be modified by changing the 'Overdrive' setting. We recommend using the 'Medium' setting for fast response without overshoot, but the 'Strong' setting is slightly faster, so you can use it if you don't mind small pixel overshoot artifacts appearing as lighter trails following moving objects. Like most monitors, the AOC Agon AG271QX doesn't flicker and instead, shows each image for a full frame. 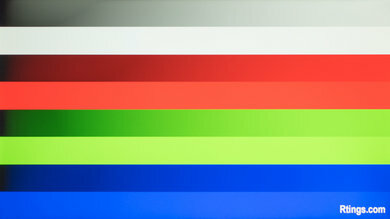 The absence of flicker makes motion appear slightly smoother but results in some persistence blur as objects are followed between frames. It is not possible to use Black Frame Insertion (BFI) to add flicker and help reduce persistence blur. 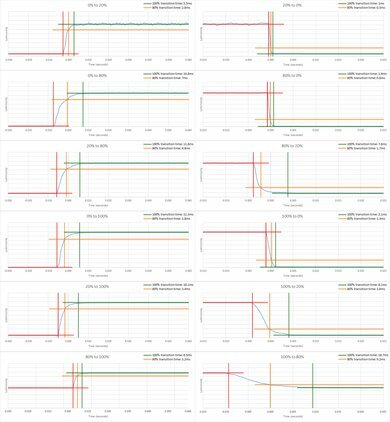 This is unfortunate as flicker is useful to clear up motion even further with fast paced content, such as action or fighting games. The monitor has a high native refresh rate of 144Hz. Freesync on this monitor can adjust the screen's refresh rate to match the frame rate of a compatible graphics card, which allows playing graphically-intensive games with significant framerate drops without tearing or stuttering. 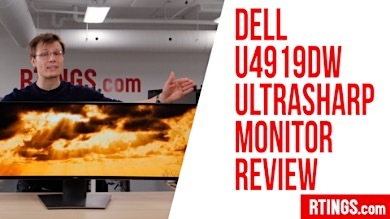 This is one of the best 144 Hz monitors we've reviewed in 2018. 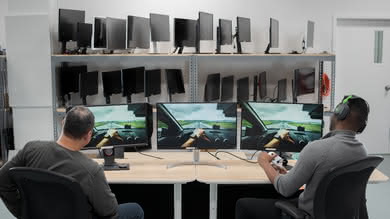 Update 01/15/2019: We have tested the AG271QX with NVIDIA's new FreeSync drivers, and there were no issues. 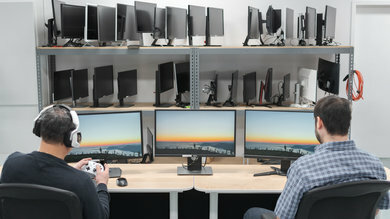 G-Sync could be enabled from the NVIDIA Control Panel, and the monitor was completely tear-free for the entire FreeSync range. 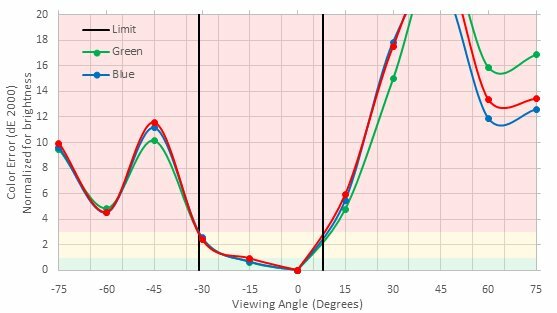 The monitor has excellent low input lag, a high QHD resolution and a large 27" diagonal, which is great for almost any usage. 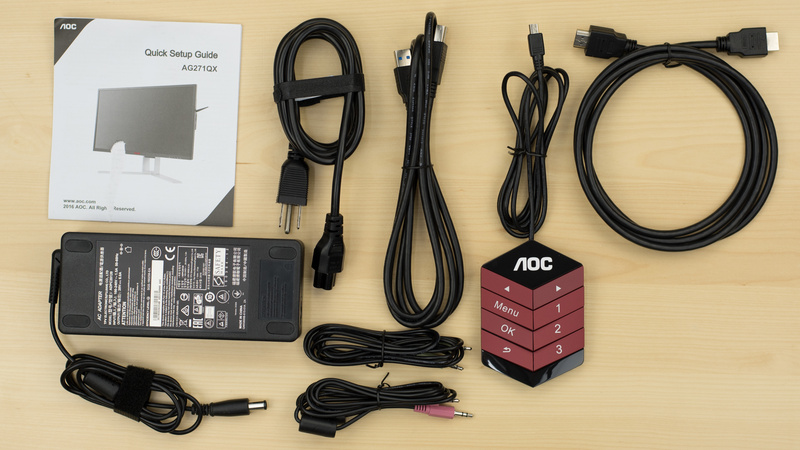 The input lag of the AOC AG271QX is excellent, as expected for a gaming-targeted monitor. 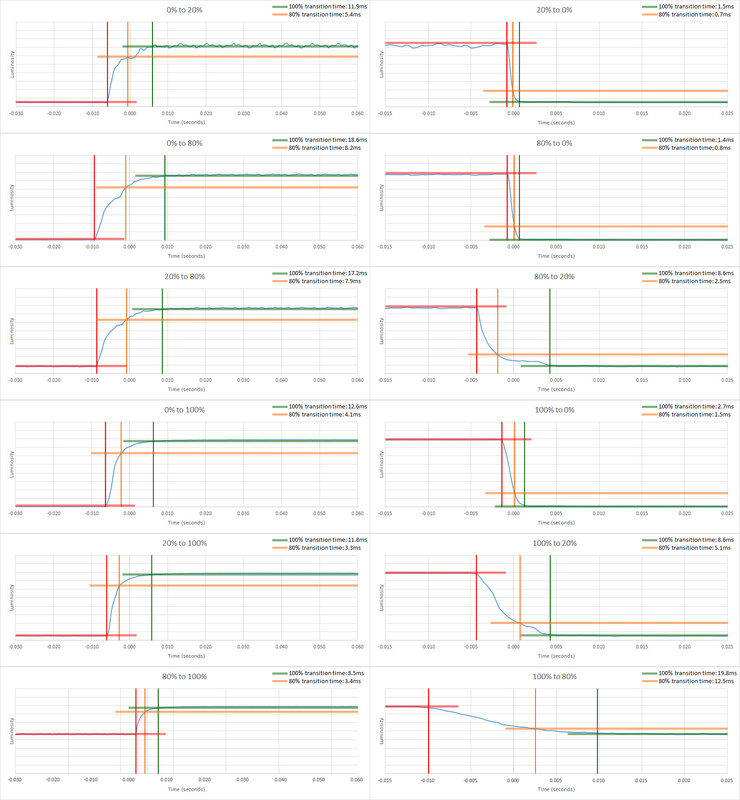 The input lag at 60Hz is a bit longer, however, this is due to the longer scan out time and so is expected. The FreeSync input lag is roughly equal to the input lag at native resolution, which is great. 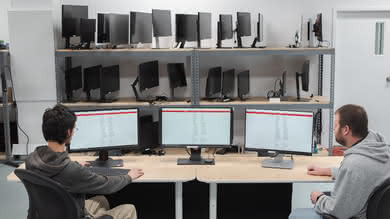 This Agon monitor provides great screen real estate due to the quad HD resolution and above average screen size. 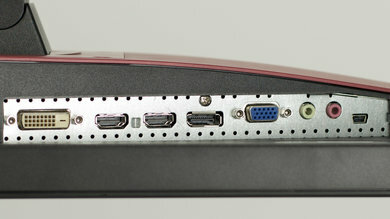 The AOC AG271QX also has a third area of inputs on the side as seen here. The on-screen display of the AOC Agon AG271QX is very intuitive to use and allows access to a wide range of settings and adjustments. The external quick settings is a nice feature, and overall the controls are very easy to use. This monitor has a few additional features, such as the quick settings toggle (pictured here) and options to adjust the overdrive when gaming or to increase shadows in dark areas. 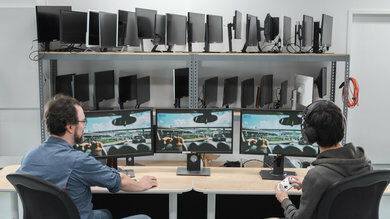 The controls are located under the right-hand side of the monitor. They are fairly easy to press and do provide some tactile feedback. 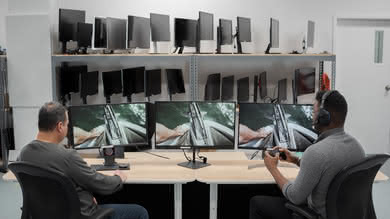 We tested the 27" model with a 144Hz TN panel and FreeSync (AG271QX). 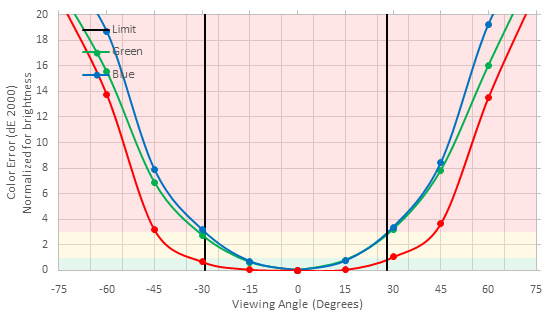 There are many more variants of AOC Agon Gaming monitors with differences in resolution, size, refresh rate and adaptive sync support which are described in the table below. If someone comes across a different type of panel or if AOC AGON AX271QX doesn't correspond to our review, let us know and we will update the review. 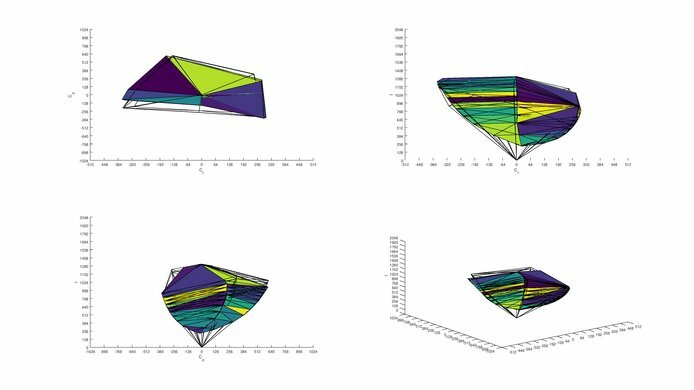 Note that some tests such as the gray uniformity may vary between individual units. Left: BenQ Zowie XL2540. 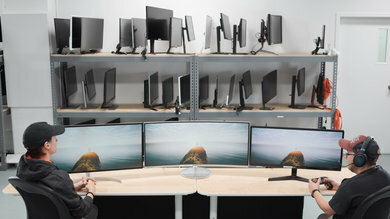 Middle: AOC AGON AG271QX. 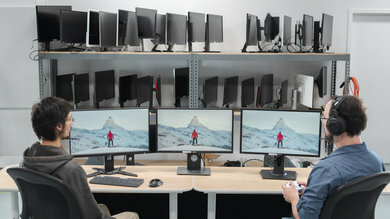 Right: Dell S2716DG. While the AOC Agon AG271QX is a good monitor for mixed usage, it is focused on fast-paced gaming with high refresh rate, FreeSync support, and low input lag. 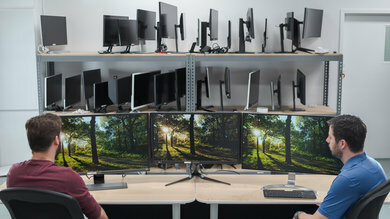 For other uses, there may be better or cheaper monitors available. See our recommendations for the best gaming monitors for PC, the best freesync monitors and the best gaming monitors for Xbox One X. The AOC AGON AG271QX is much better than the MSI Optix G27C. 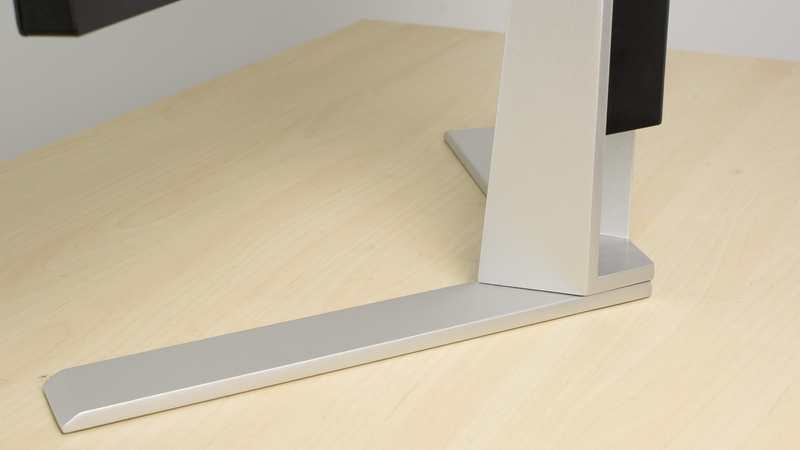 The AOC AGON has much better ergonomics, making it easier to place it in the most comfortable position. The AGON displays gradients with almost no banding and has a very fast response time, so motion looks crisp with very little blur trail. 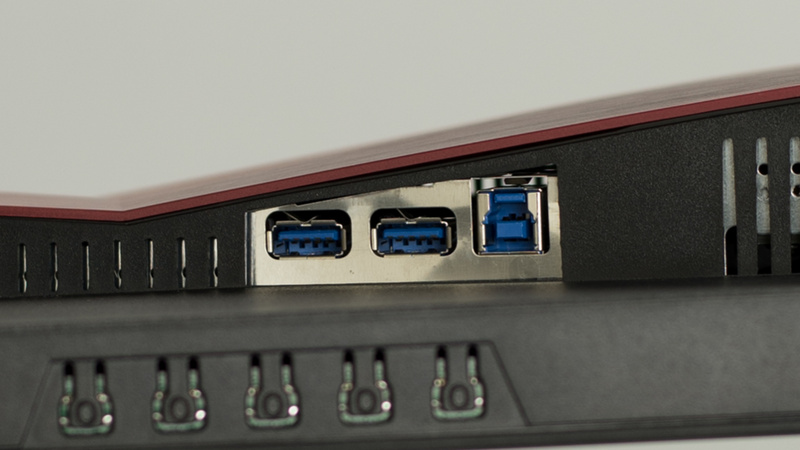 The higher resolution of the AGON makes it easier to get more done or to see more fine details in games. The AOC AGON AG271QX is marginally better than the Dell S2716DG. The AG271QX has better black and gray uniformity which is great if your work involves a lot of web browsing or photo editing. 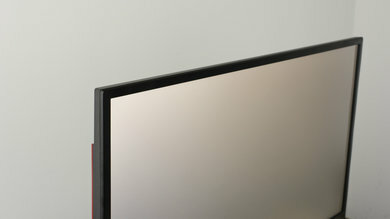 The AOC AGON AG271QX also has a remarkable gradient with no visible banding. The Dell S2716DG, on the other hand, has an option to introduce flicker so as to make the image crisper. 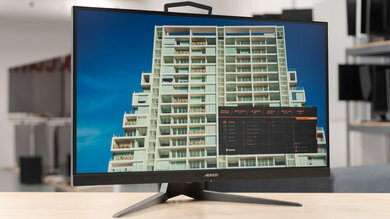 The Samsung CHG70 is better than the AOC AGON AG271QX. The Samsung has better native contrast than the AG271QX, important for dark room viewing, although the AG271QX has better black uniformity. The AG271QX has a slightly faster response time, but the CHG70 has an optional black frame insertion feature that can improve motion by reducing persistence blur. 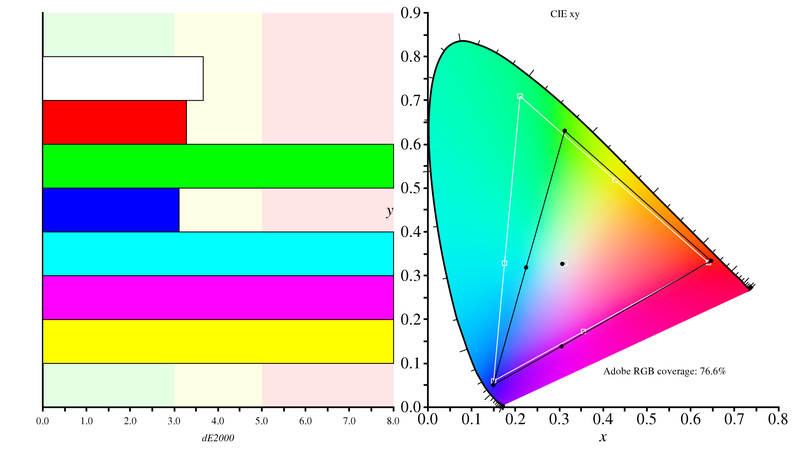 Finally, the CHG70 supports HDR, and can display a wide color gamut. 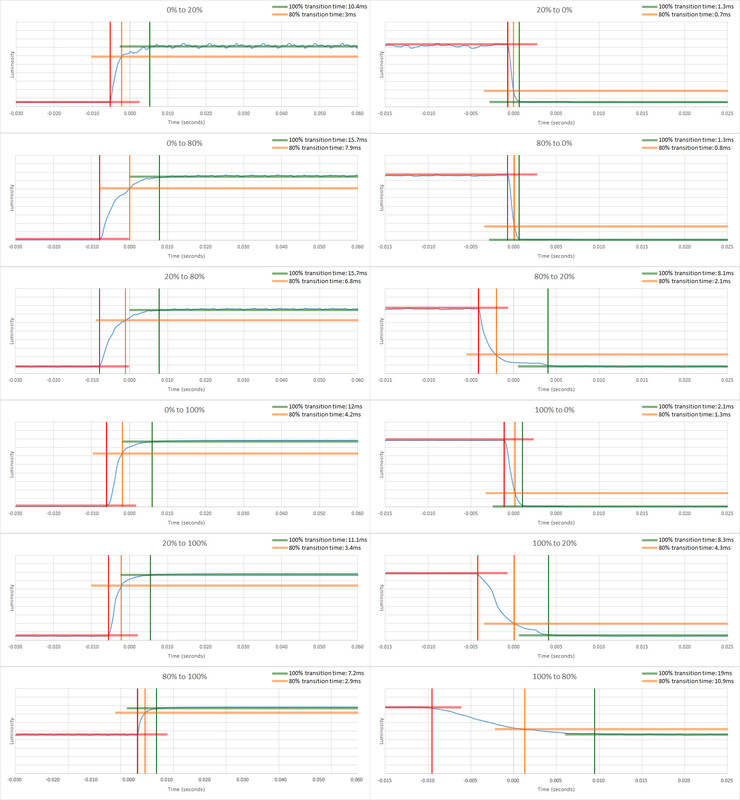 The ASUS PG279QZ is better than the AOC AGON AG271QX for most people. 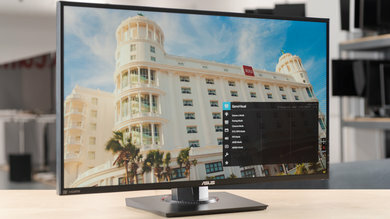 The ASUS is an IPS monitor with much better viewing angles whereas the AOC has a TN panel with almost instantaneous response time and better black uniformity. 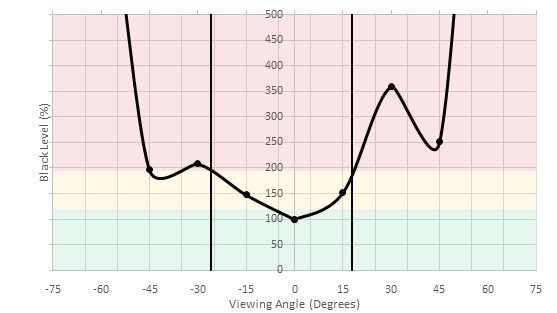 The ASUS PG279QZ has better ergonomics and a BFI option to make the image crisper. The AOC AGON AG271QX is slightly better than the ViewSonic XG2402. The AG271QX is better at displaying large areas of similar color, as it supports 10-bit color. 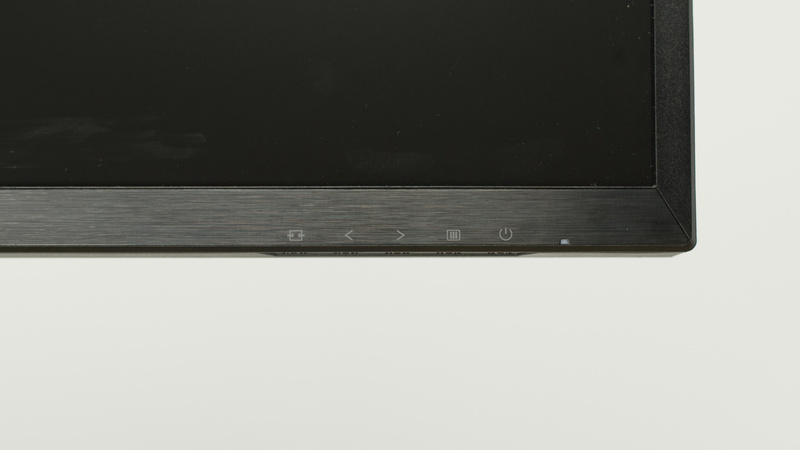 However, the main advantage of the AGON AG271QX is the larger, higher resolution screen, that makes it much easier to see fine details in games and for multitasking. The AOC AGON AG271QX and the Dell S2417DG have very similar performance. 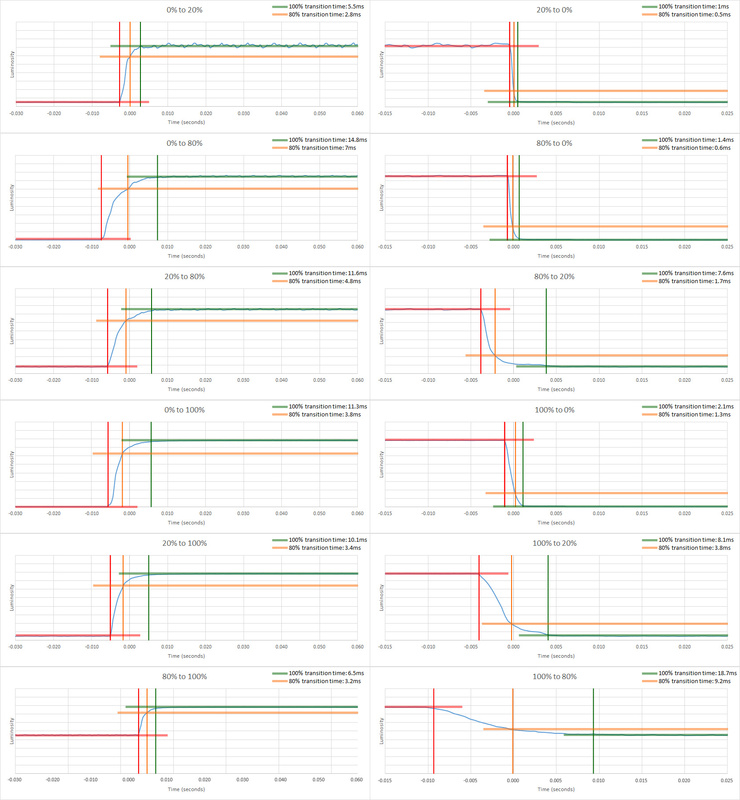 Both support variable refresh rate implementations. The S2417DG supports G-SYNC and the AG271QX supports FreeSync. 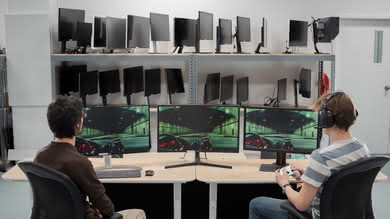 The Dell also supports black frame insertion (BFI) through the NVIDIA ULMB, which can help clear persistence blur. 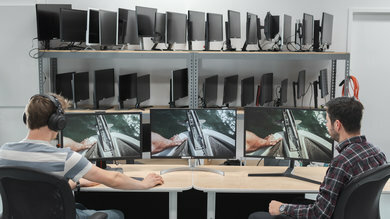 It also has better ergonomics that make it easy to position the monitor to your liking, whereas the AOC AGON has a larger screen size which makes it more comfortable to work on. The AOC AGON AG271QX is better than the ASUS PB277Q. The AGON AG271QX is a gaming-oriented monitor, and has a much higher native refresh rate, so fast motion looks much smoother. The AOC also has better dark room performance with a higher native contrast ratio and better black uniformity. The AOC AGON AG271QX is better than the HP OMEN 27. 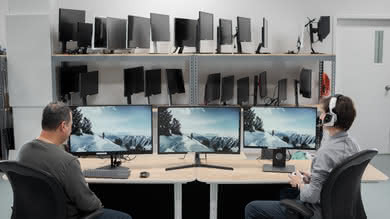 The AOC AGON AG271QX has better ergonomics and this is very useful no matter the usage. 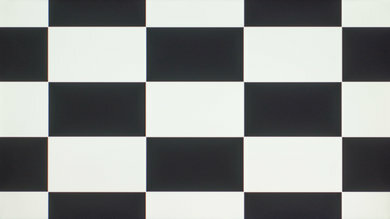 It also has better black uniformity that improves the quality of blacks in a dark room. 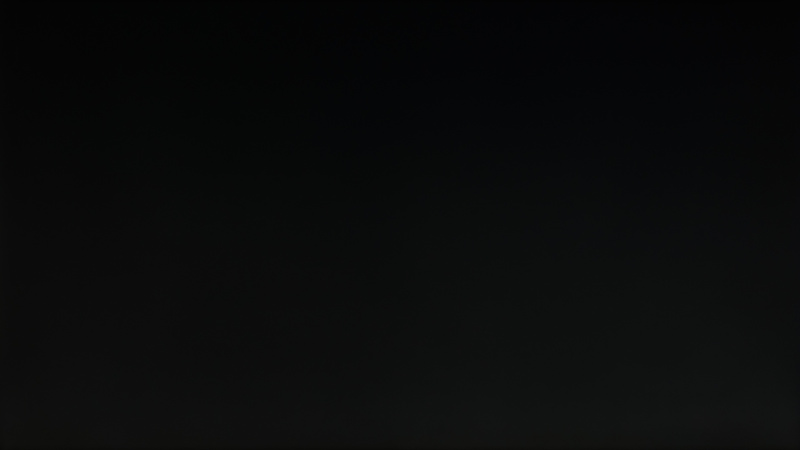 On the other hand, the HP supports the black frame insertion feature that helps reduce blur during fast action. The AOC AGON AG271QX is better than the Dell U2717D for most users, unless you need a wider viewing angle. The AGON AG271QX has much better motion handling, with almost no motion blur and a fast refresh rate, with very little input lag. 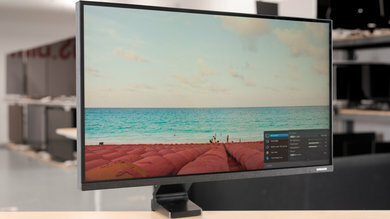 The IPS panel in the U2717D has a wider horizontal and vertical viewing angle, good for wall mounting or sharing your work with someone, but it has worse dark room performance. The AOC AGON AG271QX is much better than the Samsung Space SR75. The AGON is better for gaming as it supports FreeSync, has much lower input lag, and a faster response time. The AGON has a worse contrast ratio than the Space, but has better black uniformity. 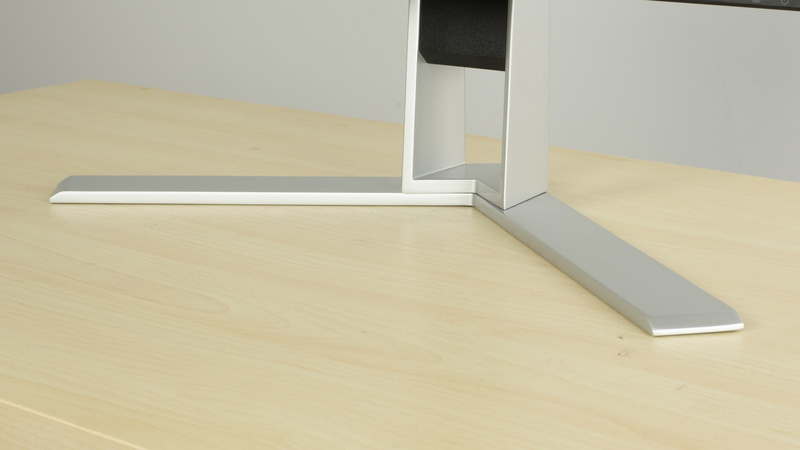 Although the SR75 has a much smaller stand and space-saving design, the AG271QX has better ergonomics and can be VESA mounted. Good for mixed usage. The picture quality is below average. However, this is made up for with excellent motion handling and input lag due to the 144Hz refresh rate and support for FreeSync. 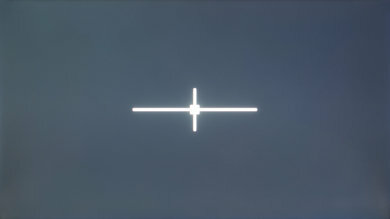 Unfortunately, the image degrades rapidly when viewed at an angle and the sides lose accuracy when viewed from up close. Decent monitor for office use. The AOC Agon AG271QX gets bright to overcome reflections, which is great. It also has a light-matte finish which handles direct glare well. 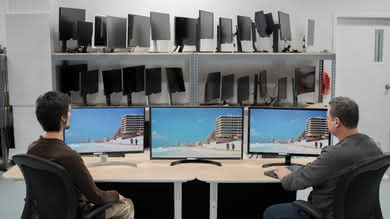 The 1440p resolution is also comfortable for working on 1 or 2 windows at a time. Unfortunately, the edges of the screen look non-uniform due to the poor viewing angles and the image quality is below average. Great choice for gaming. The AOC AG271QX feels extremely responsive due to the high native refresh rate and low input lag. The monitor also supports FreeSync to adjust the refresh rate to the game, which is great and removes screen tearing. Unfortunately, it can't flicker the backlight to clear up motion further and the picture quality is sub-par. Decent monitor for watching movies and TV shows. The monitor handles reflections well due to great screen brightness and light-matte finish. Color accuracy is also decent out of the box. Unfortunately, the image degrades rapidly when viewed at an angle and the contrast ratio is sub-par. Decent for creating media such as editing photos or videos. The monitor handles surrounding light well due to the light matte finish and can get bright to overcome glare. 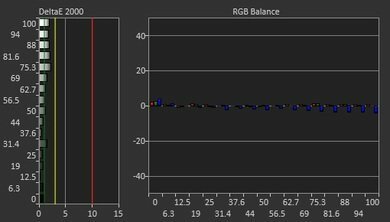 Unfortunately, it doesn't support the wider Adobe RGB color space and the image loses accuracy when viewed at an angle. The picture quality of the TN panel is also worse than average. Doesn't support HDR. Also, the AOC AG271QX doesn't support HDR features such as a wide color gamut, and can't get bright. For an HDR gaming monitor, see the Samsung CHG70.